Staff was very nice and attentive also the location is great! Great location, close to the nimam area and maya shopping mall, clean and giant lockers for your bags. Sadly we were the only ones that night but will definitely come back if we are in Chiangmai again. Box was great and quiet place to stay. I booked one night but ended up staying three. The facility is very clean, the staff is very friendly and will help in any way they can. The dorms are very private and the bathrooms are very clean. The rooms are a bit muggy but turning on the fan will alleviate it. Breakfast includes an omelette and salad. It is a bit of a walk into the old town but there is more local culture in this area. Nomad friendly desks. Huge security lockers in cages, use your own lock, they are very tall but not quite deep enough so suitcase won't go in but a backpack probably would. Amazing breakfast, personally cooked eggs from the cafe, juice, cereal, toast, coffee. Beds slightly firm but ok. Strong built beds. Great A/C in room. Spotlessly clean throughout. Great design touches around. WiFi good. My stay has been quiet, and this has suited me. Keycard entry. Guitar. Dart board. Nice cafe at front. Stayed twice at box hostel, once when looking for an apartment in Chiang Mai and a year later after I moved out of my apartment. It isn’t really a social hostel but that’s not what I was looking for... it’s a nice place to stay and chill out. On the edge of Nimman area of Chiang Mai. Cool minimal style decor, with a nice cafe downstairs which plays really nice house music most of the time. Clean. The staff are friendly. Breakfast is eggs with salad, toast, cereal. Beds could be comfier. I really enjoyed my stay here. The atmosphere is good and it's a nice place to hang out for a bit and have a coffee. I liked there lattes--strong! The beds were nice and I found everything to be quite clean. The price was also reasonable and included a nice, but small breakfast, with a fried egg, and fresh salad. The owner was also really friendly and provided me with assistance when I needed some help or advice. 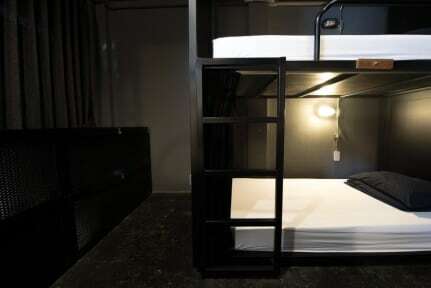 Box hostel is located a little outside the wall. Its in a quiet area and I really enjoyed my stay here for the facilities were really good, they had a big locker where I could store my items safely and the beds/shower was on par. Staff were pretty nice too. I would stay here again if I was to come back to Chiang Mai. My only complaint about this hostel is that it was a little far from the major things to do in Chiang Mai (I found anyways). Other then that it was clean, easy to find, had good food, had good hot water and the cafe was so cute. The ladies at the front desk were super helpful and were able to help me with all my concerns during the stay. Overall it was ok. There isn’t much of an atmosphere so not good for solo travelers. It was a good location close to the old city but far from most of the attractions. It was clean however the beds are so close to the floor. I felt like I was sleeping on the ground. Ac works really well in the rooms. This place has horrible staff We accidentally got locked out one night around 11 pm. There was no one at the reception and no number to call, we were stuck outside alone and scared to be honest. We finally found a number online and called about 30 times to no answer, we where beginning to freak out when luckily another guest arrived and let us in. The next day when we complained and told them how scary and dangerous it was they could not have cared less. no atmosphere here either.